Have you ever wondered what it might be like to mine diamonds and experience the backbreaking work to unearth some of the most valued gems in the world? Click here to play! Well, now you can experience that satisfaction without all of the hard work. 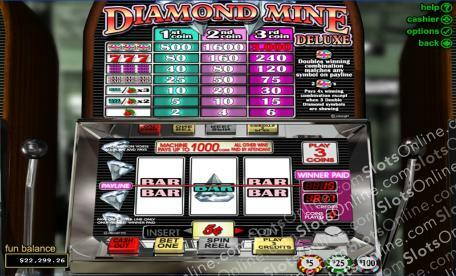 Strike it rich at the Diamond Mine Deluxe! Lucky Sevens always pay off when you're in the business of making money. Even if that business is diamond mining. If you can spin three lucky sevens across the pay line, you'll get rewarded with up to 240 coins. Triple Bars are there too, offering up to 120 coins. Doubles will get you up to 75 coins. Also keep an eye out for single bars and cherries while you're working hard in the diamond mine as they carry a reward as well. The best thing about this Deluxe Diamond Mine is the 2x symbols. If you can collect three of these across the pay line, you'll get up to 3000 coins! These little gems also act as a wild card and will substitute for all other symbols. Get down and dirty in the Diamond Mine Deluxe for your chance at a hefty paycheck. The 2x symbol will act as a substitue symbol. These will double the prize if they appear in any winning combination. If you get three of these across the pay line, you'll get up to 3000 coins. Two of these will pay out four times the winning combination.